Puppies Have Arrived at Malagold! for information on the litter listed below. A good breeder must keep in mind the long term picture of the breed, not just the particular breeding being considered at the time. Always think ahead to the future  and at Malagold, we always ask this question - Will what we do today have a positive impact on this breed tomorrow? If you keep an eye on the future, you will find that you can have it all - a champion show dog, an obedience titleist, a working therapy dog and a wonderful family companion. All in one! Not always looking for a puppy? 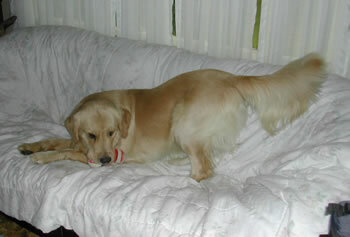 On very rare occassions we have older dogs that we will place into a new family. This does not happen too often. But - every once in a while a lucky family can be blessed with that perfectly wonderful dog. Check out Dealer and read about his new family! If you are interested in additional information on how to make a Malagold Golden Retriever a member of your family, contact us at Malagold. In the meantime, take a look at the future of the Malagold family of dogs! but he is still a charmer! 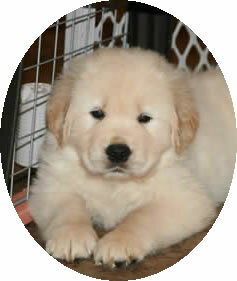 Malagold puppies are available only on a reservation basis. The best thing to do is to contact Connie directly (via telephone - 269-375-8846) and discuss with her your interest in one of our special babies. If you decide that a Malagold puppy is a good fit for you, then you can request that your name be added to the reservation list. Sometimes, the list can get pretty long! So, even if there is not litter currently listed on the website, you might want to call Connie and ask about how the puppy reservation list looks. It might be just the right time to get your name added! Justin, The Croc Hunter! Our Coriander baby boy playing with his favorite "toy" - his "Crocs"! Malagold had one very special little girl, born June 15th, 2003, whose life has been documented on film from the time of her arrival. 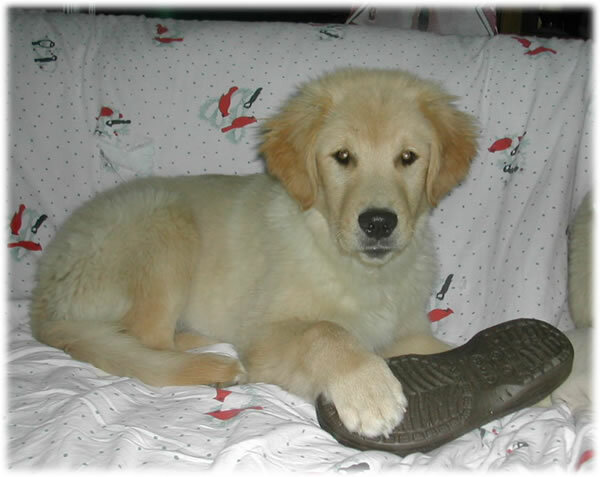 Check out Allie's Puppy Journal and view the antics of one scampy Golden Retriever puppy - her first eight weeks of puppyhood will tire you out! There is an ALLIE UPDATE - her first year in pictures. See how she has grown!